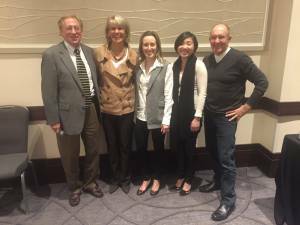 Three top-notch communications firms, two in the U.S. and one in China, were welcomed as full members of the Public Relations Global Network (PRGN) at the spring conference of one of the world’s largest networks of public relations agencies on Thursday, April 28, 2016 in Washington, D.C.
PRGN welcomes three new members to its global network: Susan Evans, president of Evans Larson Communications, Minneapolis (second from left), Loren Mortman, president of The Equity Group, New York City, and Joanne Chan, managing director of LBS Communications Consulting Ltd., Hong Kong. They are joined by Ed Stevens (far left), chairman / CEO of Stevens Strategic Communications, Cleveland, Ohio, and Evelyn John Holtzhausen (far right), founder of HWB Communications, Cape Town South Africa, and president of PRGN. The agencies are: The Equity Group, headquartered in New York City with a longstanding reputation for excellence in investor communications and outreach; Evans Larson Communications from Minnesota, specializing in omnichannel communications strategies for a broad range of national and international clients; and LBS Communications Consulting Ltd from Hong Kong, excelling in financial communications and investor relations with one-stop expertise in the Greater China region. 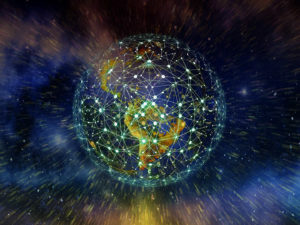 These new members extend the range of the network, expanding the PRGN presence into most major cities around the globe. 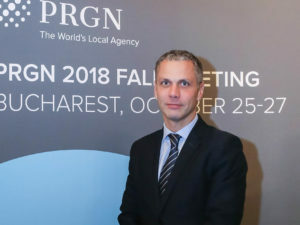 The induction into the global consortium was made during PRGN’s twice-yearly meeting in Washington, D.C.
“With a new total of 47 member agencies, PRGN is ideally positioned to help its clients succeed in global markets,” said Evelyn John Holtzhausen, founder of HWB Communications, Cape Town South Africa, and president of PRGN. “We are so excited to be part of this well-respected global network with so many passionate PR experts and we believe the exchange and cooperation within the organization will make LBS an even better PR consultant with global insights and resources in different parts of the world for our clients,” said Joanne Chan, managing director of LBS Communications Consulting Ltd.
PRGN partners meet twice a year in cities around the world. The next meeting will be held in November 2016 in Lisbon, Portugal. At each meeting, the firm’s leadership discusses best practices, and ways the network and its client base can collaborate in local markets around the world.